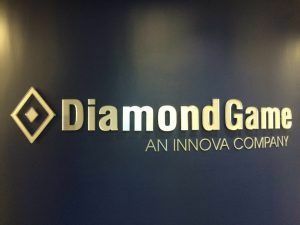 Diamond Game headquarters in Chatsworth, California was going through a logo change and reached out to us for a new sign to replace an existing one they already had installed. They wanted a similar look to the existing sign so we went out to the location to do a site survey. 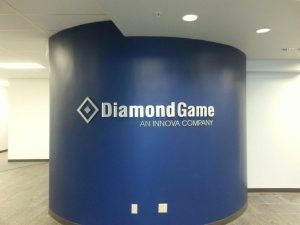 As you can see from the photos, this sign was installed onto a curved wall so the letters curve with the wall making the sign convex. The existing sign was metallic so we made sure to use a substrate with a metallic look also. The sign is made from acrylic and metal. 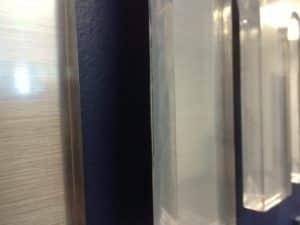 We laminated 1/2″ thick clear acrylic with a brushed aluminum laminate and routed the letters and logo from the substrate. We can’t curve the actual substrate, but since we were using individual letters, we were able to install the individual letters along the curve of the wall. After the letters were routed, we applied VHB to the back to get them ready for installation. Since the back of the entire letter wasn’t going to touch the wall, we only put VHB in the center. Before installation, we create a pattern for the sign that lays out where each component of the sign goes. When we install the sign, the first step is to put up the pattern and make sure it’s level to assure that the letters are straight and in the right position. The installers then remove the back of the VHB and install each component of the sign and each letter one at a time. It can take some time to make sure that all of the letters are properly installed, but you can be assured that any sign installed by us will look great, and we don’t leave a job site until we’re happy with the end result.